UN urbanisation report highlights - .PDF file. According to the latest revision of the United Nations report on world urbanisation, for the first time in our history more than half the world’s population is now living in urban environments – and it is estimated that this will increase to two in three people by 2040. What we are experiencing is the impact of urbanisation on a global scale, leading to the rapid growth of ‘megacities’ as populations grow and people continue to migrate from rural areas to find work in cities. At the same time global car ownersip has now reached one billion and is expected to continue to rise, some estimates putting this at two billion cars within a few decades. How can we fit this growing number of cars in to the increasingly densely populated megacities of the future? Is there any point in trying to do this anyway,when we will only be faced with more and more congestion plus the difficulty and expense of finding somewhere to park? During the last five years the cost of congestion in Europe has almost tripled from approximately €63billion in 2006 to €200billion in 2011 (Frost & Sullivan Urban Mobility 3.0). It is clear that the rise of the megacity and growth in the number of cars on the world’s roads is not going to be sustainable unless the cars and the megacities of the future become completely integrated. The scale of this challenge is leading to an explosion of innovative thinking and development of new concepts for achieving this, fuelled by the economic benefits that are expected. One key shift in thinking that is required is recognising that the problem we are trying to solve is not just how to get more cars in to, and around, our mega-cities, but how to deal with the millions of people living in these cities who all have places they need to get to. In the future individuals, companies and megacity authorities will need to provide personalised and efficient urban mobility solutions across different transport modes in order to address this issue. So, what does the growth of megacities mean for the car and car companies alike? 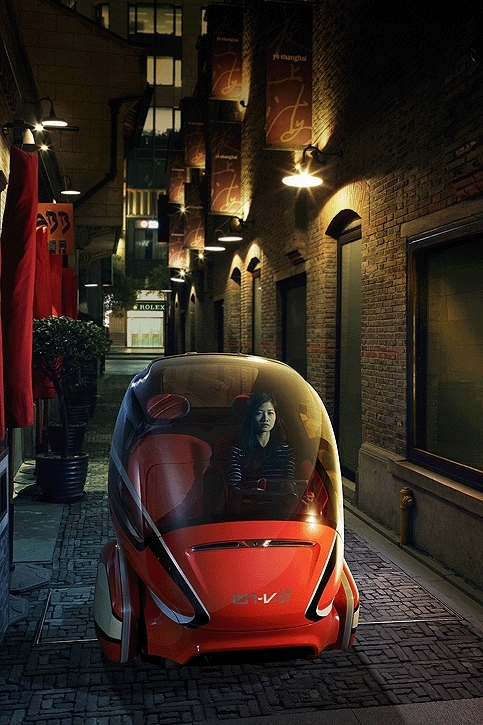 Firstly the design of the megacity car is likely to be radically different from the city cars of today. Secondly our relationship with the car is also likely change. Cars of future megacities are likely to be a lot smaller in comparison to cars today and may not even look like the same. As I speak, car manufacturers and other researchers are embracing this opportunity and are already working on imaginative concepts that fit neatly with the need to integrate the car and megacity. General Motors’ EN-V zero emissions electric networked car concept is one example of this. Their concept is extremely small, environmentally friendly, and highly manoeuverable. The vehicle is also “networked enabled” meaning it can share information about its location and speed with other vehicles so that it can drive autonomously. The car also has the ability to come to you when you call for it. 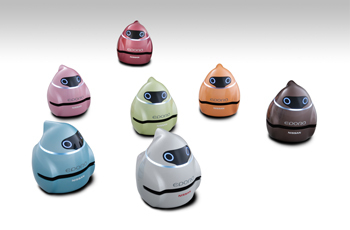 Another example of a megacity concept are the NISSAN EPORO robot cars that are taking existing collision avoidance technology to a whole new level by developing “swarming” algorithms modelled on the behaviours observed in shoals of fish, to avoid collisions and optimise the movement of large numbers of vehicles in close proximity. The Massachusetts Institute of Technology’s (MIT) citycar concept is also specifically optimised for megacities, replacing the traditional drivetrain with four inwheel electric motors which allow the car to do ‘O-turns’ and move sideways. By dispensing with the traditional drivetrain and steering wheel, MIT engineers managed to free up their designers, allowing them to create a novel folding and stacking concept inspired by supermarket trolleys. By utilising this technique, MIT were able to fit up to eight of these citycars in to a traditional parking space (see video below). In addition to these radical changes in car design and associated technologies in our megacities, I believe there will also be a paradigm shift in the way we see the citycar as consumers. The car as the symbol of freedom and independence looks very different from the perspective of the megacity when you need to store the car as well as find (and pay) for parking whenever you want to use it. Some may even question why would you want to own a citycar at all when, to quote MIT’s designers, “drivers could simply drop the car off at the stack nearest to their destination and walk away”. To assess the feasabililty of such a shift in thinking we must see if there is any evidence that consumers will be prepared to radically change their relationship with the citycar. Two current trends suggest there is. There is currently a massive growth in car sharing business models with car companies themselves embracing this initiative. Secondly generation-Y consumers don’t seem to have the same affinity with the idea of owning the car as previous generations (a trend which is proving challenging to the marketing departments of car companies globally). Perhaps for the present generation-Y, freedom and independence is not represented by the car but the smart phone, a device that provides the means to form relationships with people all over the world without the need to be physically mobile at all. Looking back, in many cases it is hard to see how emerging technologies overcame the barriers they faced on the way and didn’t just wither on the vine. What’s clear is that when they did overcome these challenges it was because the benefits to society were so great that it was inevitable that people would embrace them. ‘Backcasting’ to understand how emerging technologies of the past evolved in to products and behaviours of today will be a useful tool for technology businesses, designers and city authorities when forecasting with these emerging megacity technologies and changing societal trends of today. With the benefits of embracing these new technologies shaping up to be so great, I believe the megacity car will find a way to overcome the many barriers to market that it currently faces, and that it may well become a reality perhaps sooner than we might think. There already exists a solution to personal transport in crowded situations which also works very well out of town and up until relatively recently (within the last 50-70 years) was the choice of most families. Its called a motorcycle, stupid! I have seen motor cycles and push bikes in bulk causing traffic chaos and grid lock in Phnom Penh and it is not a pretty sight, so you might be the stupid one David. Something without a driver would be better. In the future, I predict that vehicles will exhibit an extremely low ratio of vehicle weight to payload weight. Most road vehicles will be low speed, single-person. Four lane roads will be replaced with matrixes of stacked, single rails, and train packets (one car, to sixty cars) will be much like internet packets: not traveling directly from A to B, but routed, lifted off one extremely straight smooth track, placed on another, and at 300 kmph, routed to another switch, and so forth. It won’t be direct line, but the “cloud” will get you from A to B so fast (much like the internet today) a circuitous route, made by interconnecting a series of straightline dashes, will put you where you wish to go at unbelievable speeds. This, in about 30 yrs. OK So the motorcycle may not be perfect and may not give us a no congestion situation but against “driverless” cars, radar guided traffic systems and the “stacked rail solution” described above I for one will stick with it. Gas turbine manufacturers. Enerzea Power solution has the reputation for gas turbine generator manufacturers. We are specialised for Gas turbine and gas turbine generator manufacturers in bangalore, India.